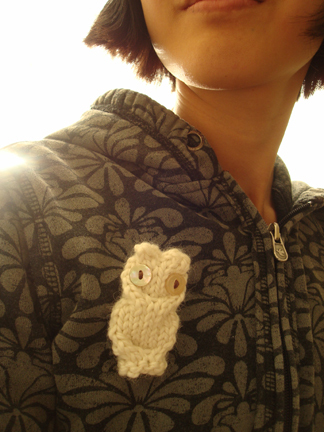 The cable owl was actually a really quick project, but I’m thinking about knitting in general. I have been avoiding knitting for quite a few years now, shying away from patterns I actually like, telling myself that “it would take too long,” and “I don’t have the patience for this”. Crocheting is indeed much quicker, more straightforward, and more of the “instant gratification,” I guess. A crochet cardigan would probably take me no more than a week if I work on it every evening. On the other hand, I have been working on this knit cardigan since the beginning of February, and I have to say, I’ve quite enjoyed the process. This is actually the beginning of the second sleeve, the last component of the pattern I have to knit before sewing everything together. I think what I like about knitting now, is the process of taking the time to do something really well, without thinking about whether it would be worth it, and whether it is taking too long. And more importantly, it is discovering that I do have the patience for this. Not only for knitting, but other things as well. Other perhaps more important things in life that requires patience, willingness to invest, concentration, perseverance, and hard work. I find knitting a good mental exercise for those things. My recent attempt in knitting has suddenly opened the door to tons of beautiful knitting patterns — now I feel like I’m able to make these things! Not that I didn’t know how to knit before — my mom’s taught me how to knit when I was in grade three — but I had just always thought of myself as, you know, a crocheter, who wouldn’t bother with knitting. Until now. That said, I still don’t know how to read most knitting shorthands, and I don’t know how to fix mistakes like dropped stitches, which can be a problem. I used to be able to just ask my mom when I lived at home. But now I’ve found the internet to be a wonderful thing when I need some explanation or demonstration. A friend once told me that knittinghelp.com is helpful, and I totally agree. I used the alpaca wool I got for Christmas. The one on the right is the first one I made and the needles I used were too small and it looked a bit uptight (even surly :/). So I tried again with a larger needle and the cable twists looked a bit better. It took me a long time to find the perfect iridescent buttons for its eyes. 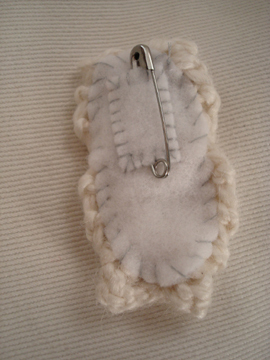 And then I sewed a piece of felt on its back to make it a bit stiffer and to attach a pin to it. 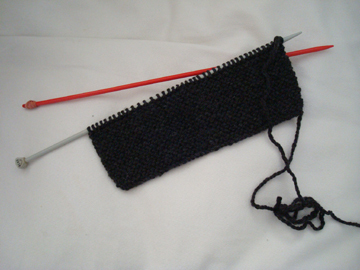 Another thing I like about knitting is that it uses less yarn. I heard that it uses 40–60% less yarn than crocheting. I don’t remember where I heard that, and I’m not sure whether I remember those numbers correctly. But either way, I’ve found that a ball of yarn goes a long way in knitting. So yesterday I ordered from the library all three of the One Skein Wonders books, so I can put my very large (and growing) stash of single (and may partial) skeins of yarn to good use. The next knitting project will be for my mom, because she gave me all her needles :P and because her birthday is coming up in May (yes, it will take me that long to finish the project). I found a cardigan that she might like, it has a lace pattern and involves circular needles, so it will be a bit of a challenge, but I hope to be able to figure it out. And just to clarify, that I am in no way turning my back on crocheting — I still find it enjoyable and fun, especially when it comes to making plushes. But it is good to know that I can enjoy knitting as well. 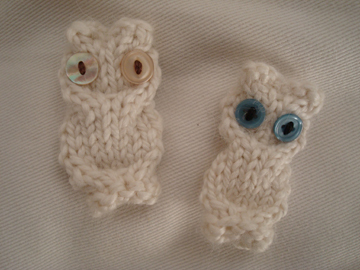 I so love this owl pattern and finally made two. The first was a brown bulky yarn. He is now over at my Mom’s, hanging out in one of her plants. 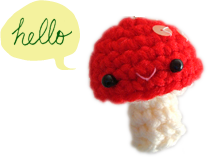 The other I made in worsted weight yarn and will make him into a pin. Such a sweet pattern and works up so quickly. My kind of project! yes, i’m looking forward to making more with different colour yarn!